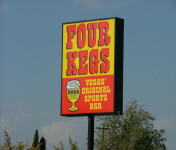 Welcome to Four Kegs! We hope you come down and join us for a drink, great grub, or just a good time! Our friendly staff are out to make sure that everything is taken care of promptly, and the comfortable, friendly atmosphere is enticing. Four Kegs currently sponsors a host of local athletic talent, including two softball teams and two soccer teams. Come join the festivities, as there are always specials going on, regardless of what season it is! The "dugout" area is perfect for large groups, featuring multiple televisions to keep up with all the action! Or if you prefer, there is more intimate seating in the back, if you'd prefer a more "family" oriented gathering. Otherwise, plop yourself down at the bar, and join us for a great time. Come on out, we look forward to seeing you soon!